(BOSTON, Dec. 1, 2011) Major appliance purchasers at Sears.com are being warned to check their orders which may have been padded with expensive five-year service contracts that they never requested, according to the consumer education website ConsumerWorld.org. The site's founder, Edgar Dworsky, discovered in shopping for a French door refrigerator over the Black Friday/Cyber Monday shopping period, that Sears.com seemed to be automatically tacking on five-year service contracts to shoppers' carts. 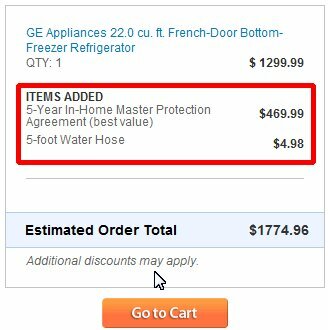 "A $1299 GE refrigerator jumped up to $1774 when an unwanted $469 extended warranty and a $4.98 water hose were added to my cart without my consent," said Dworsky. According to Consumer World, whenever major appliances in various categories were added to a shopper's cart this week in tests, unordered five-year service contracts were also automatically added. For example, an order for a $450 Kenmore refrigerator was bumped up in total price by $206.99 when a 5-year extended warranty magically appeared in the tester's cart. Similarly, a $549 front loading Frigidaire washing machine jumped up nearly 50-percent in price when a $259.99 service plan was added to the cart automatically. Though the extended warranties are easily removable from customers' carts before the order is finalized, "shoppers should not be put in the position to have to scrutinize their orders to ensure that a retailer hasn't added unwanted services or charges to their bill," said Dworsky. Dworsky is hopeful that bringing this practice to the public's attention will result in Sears adopting a more conventional approach whereby shoppers opt-in to service plans rather than have to opt-out of them. Return to Consumer World's homepage.